Organise winter gritting for your company car park before the heavy snowfall? Have you organised a winter gritting contractor to grit your car park? If you want to stay open in bad weather organise winter gritting maintenance now as the Met Office are forecasting more snow this week and in February. 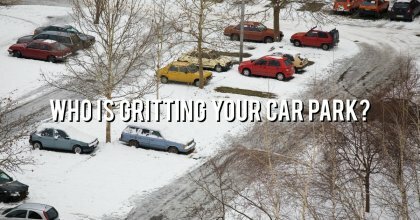 Read more about how you can get car parks gritted so workers, visitors or customers can park and get home which is vital for your private business to operate. Some of our clients are located close to main roads but if their workforce and customers can’t park in the car park it is very difficult for their business to open in heavy snowfall. We grit university car parks, retail car parks, school car parks, company car parks and industrial car parks in counties across the south east. Clearway Gritting is the largest winter gritting contractor in the south-east of England. We work from seven depots in the south east and offer winter gritting maintenance from the following locations. How do Clearway Gritting teams grit company car parks? Clearway Gritting have a reliable fleet of winter gritting vehicles that can be used to grit your business premises during bad weather. The Clearway Gritting fleet is growing and currently totals 19 spreaders and 54 snow ploughs. We use well maintained modern winter gritting and snow clearance machines so all clients can benefit from preventative and reactive gritting reliability and efficiency.